A German Far-Right Group Aids Syrian Refugees — To Stop Them From Reaching Europe A far-right movement is providing aid to Syrian refugees in Lebanon, but not for purely humanitarian reasons. The few refugees who received help didn't know the group aims to keep them out of Germany. The men included images of children in her home in a slick video they posted on Facebook in May. The video, which pitches their plan, could pass as a standard humanitarian fundraising move. A somber melody plays over images of refugee children and bedraggled tents beside a waterlogged field. "Help us to support the people in Syria and Lebanon by donating now," a man says in German. Their aim: give aid to refugees in Lebanon — to stop them from coming to Europe. The men were connected to a far-right group in Germany that calls itself the Identitarian Movement. Some members of this small, hard-line anti-immigration group started an initiative last year called the Alternative Help Association — known by the acronym "AHA" with an added exclamation mark — to deliver aid to refugees in their existing communities, with the goal of preventing them from seeking asylum elsewhere. 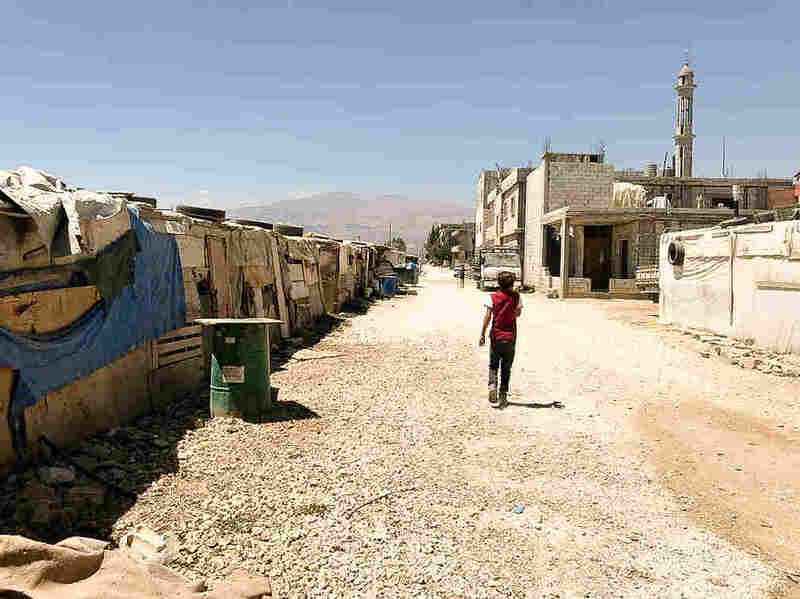 "We at AHA believe that the migration to Europe cannot be the solution for the problems in these regions," one of the group's leaders says in the video, which shows him and a colleague walking through the refugee camp. "We can be more effective locally with much less effort." Though still extremely small and barely active in Lebanon, AHA has come across the radar of established aid agencies, which are wary of the group. Till Küster, the Syria coordinator for Medico International, a German nonprofit that focuses on global health, says his organization has alerted its partners in Lebanon and Syria to steer clear of AHA. "It's not about really supporting Syrian refugees," Küster says of AHA. "What they do is they misuse the needs of refugees in Lebanon for their own political goals." AHA says in its promotional video that its work is necessary because it focuses on addressing refugee needs in Lebanon, while it claims other aid organizations are trying to get refugees out to Europe. This is "nonsense," says Küster, who notes that Lebanon is awash in aid groups working to address refugee needs. "There are so many initiatives and associations working for refugees," he says. "So I don't really think there's a big need for AHA to also start working there." The United Nations also spends hundreds of millions of dollars helping Syrians in Lebanon, providing assistance to over 1 million registered Syrian refugees and many Lebanese affected by the refugee crisis. By claiming that other aid groups help bring refugees to Europe, Küster says, AHA is trying to influence a sensitive debate among the German right wing over where humanitarian organizations should take migrants who are rescued while trying to cross the Mediterranean Sea. In presenting themselves as helping refugees, AHA's members are "hiding their real message," Küster says. "In the end, though, the idea behind it is coming from a far right-wing corner of political society." Sven Engeser is a leading AHA member who appears in the group's Facebook video from Lebanon. He's also an activist with the Identitarian Movement. Speaking with NPR from Germany, he denied that "Identitarians" have connections to the country's far right. He describes himself as a "patriot," which he defines as wanting to stop "culturally and ethnically different" immigrants, especially Muslims, from coming to Europe. "We want to stop Muslim migration to Europe and to stop supporting them in Germany," he says. "It is a problem because it's not easy to integrate them. This is a Christian continent." "We want to save our borders. Because of the mass immigration to Europe, I think we lost our identity." Simone Rafael from the Amadeu Antonio Stiftung, a Berlin-based group that researches extremist movements, says regardless of how the movement defines itself, its ideology is in keeping with the far-right. "The beliefs behind their actions are almost all classical right-wing, extremist beliefs," she says. "The main part is racism, but they don't call it racism. They try to wrap it up in nicer ways." Instead, she says, they use the phrase "ethnopluralism" — a belief that every people belongs to their own part of the world "and should stay there." "What they really want is that these [far right-wing and racist] ideas become main principles for the whole society in Germany, which they aren't," says Rafael. "And so they try to hide their intentions to gain more influence." Rafael says the Identitarian Movement is so Islamophobic that they don't even consider German followers of the Muslim faith to be German citizens. "They don't care that there are Muslim people in Germany, who have always lived here. For them, they are not Germans," she says. According to German press reports, in 2015, Germany's Interior Ministry concluded that the Identitarian Movement was part of a network of far-right groups in the German capital Berlin. Rafael says German authorities are keeping an eye on the group, concerned that although it may number just a few hundred, it has extremist connections and a growing reach on social media. A video published by the movement can be found on white nationalist websites, showing white Germans pleading for the preservation of their "identity." The movement has received praise on those websites, even from some commentators who appear to be American and say they wish its "pro-white" views would be adopted in the United States. Engeser insists that AHA's goal is to "help" Syrian refugees in Lebanon so they have a better hope of staying close to home, and eventually return to Syria. With little knowledge of the aid world or Lebanon, Engeser's first efforts faltered. He says they first wanted to establish a refugee camp in Lebanon – not knowing that Lebanon does not allow the formation of refugee camps. Refugees live in informal tented settlements, often renting the land from a private owner. So far, the amount of aid actually provided by AHA remains tiny. Engeser says the group has received enough donations to pay rent for 10 Syrian refugee families. But they are struggling to meet the rent payments this month. "The money will come," he says. But Engeser said they found Lebanon is "more expensive than we thought" — and so they could only pay the rent for a few families. One of the refugees they helped is Um Mahmoud. She is 55, but deep worry lines on her face give her the appearance of somebody much older. A widow, she lives with her disabled adult daughter in a small tent on a mud street crammed with the tarpaulin homes of other refugees. Even for this basic shelter, she must pay a landowner a monthly sum of $100 — a cost she can barely meet. "Around three months ago, someone started to pay the rent," she says. "It means my mind can rest a little." Like several of the refugees receiving this aid, Um Mahmoud doesn't know about the controversial political affiliations of the group, or about its desire to keep people like her out of Europe. All she knows is she is desperate for the help. Inside her tent, a few foam mattresses lie at the edges of a bare concrete floor. With no fan or air conditioning, on a recent August day it was stiflingly hot. When asked if receiving aid from AHA means she wouldn't go to Europe if she had the chance, "No," she says. "Life is still miserable here. And maybe in Europe, I can [get] better medical care for my disabled daughter." Which country in Europe would she go to? "Germany," she says. "Isn't that the best one?"